Fri, Aug 3, 2018, 12:35 pm SL Time, ColomboPage News Desk, Sri Lanka. Aug 03, Colombo: Sri Lanka President Maithripala Sirisena says the only motive of certain politicians rallying around Lipton Circus shouting obsolete slogans against the government saying not to betray the country and protect the war heroes, is to achieve their petty political objectives. President Sirisena made these remarks participating in a ceremony to vest many development activities at the Hela Bojun Hala in the Manampitiya town, with the public, on Thursday. The President said the present government had not taken any steps to divide the country or to subjugate the country to any force and there will be no opportunity to divide the country in the future. The President also pointed out that the present government has taken steps to liberate the war heroes from all the pressure from internationally. He said the any slogan the opposition saying against the government is not relevant for today and reminded that the talks relating to the electric chairs, international courts and foreign judges are no longer valid under the present government's administration. The development works of the Hela Bojun Hala in the Manampitiya town have been completed at a cost of Rs. 21.53 million under the "Pibidemu Polonnaruwa (Awakening of Polonnaruwa)" District Development Programme. Sixty projects out of the 180 development projects completed under Pibidemu Polonnaruwa District Development program were declared open with the participation of the President, Ministers, and experts yesterday. 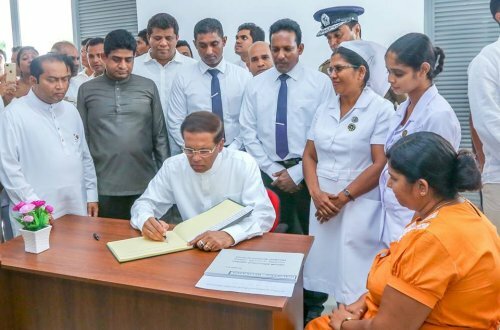 The President also opened the Welikanda Medical office, constructed at a cost of Rs.134 million and launched the construction of external care unit of the Manampitiya Hospital and the clinical building at a cost of Rs.132 million. Ministers and MPs, including Minister Thalatha Athukorala, State Minister Weerakumara Dissanayake and others participated on this occasion.